Mike Morales, Robert Goodheart and Mike Grant. 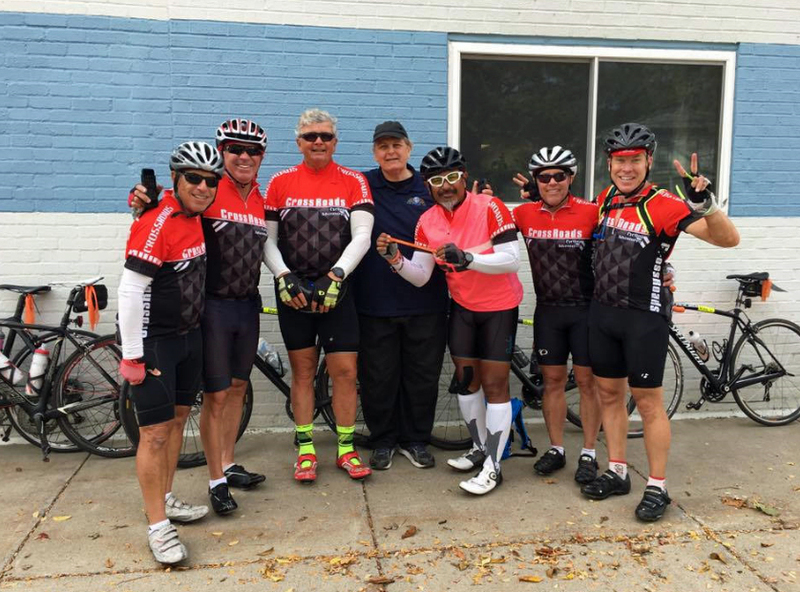 From sea to shining sea -- that is what a team of six accomplished on bicycles recently in a magnificent “Road to Victories” fundraiser for the Multiple Myeloma Research Foundation (MMRF). 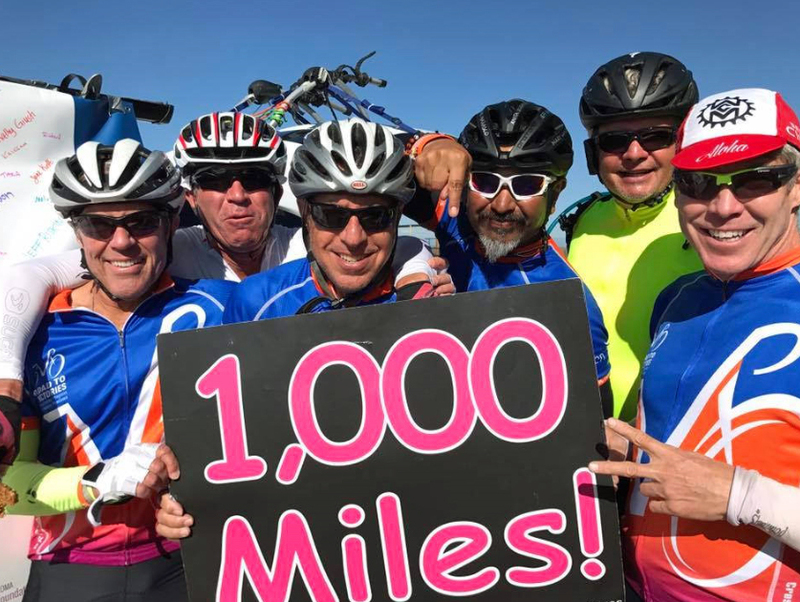 From Manhattan Beach, California to Jennings Beach in Fairfield, Connecticut, through 120-degree desert heat down to frost warnings in Herkimer, New York, the cyclists persevered and along the way helped raise more than $410,000 for the MMRF. But that wasn't the most important aspect of the ride. Sure, it was nice to meet our financial goal because you need money to pay for the research to help find a cure for this blood cancer which has no known cure at this time. Time is certainly of the essence for my friends Carmen Phaneuf of New Jersey and Jean Dreyer of New Hampshire, both patients who have endured years and years of painful treatment. Because of the new procedures and medicines developed by the groups working with the MMRF, Carmen’s cancer is undetectable today. No, the most important part of this 3,411-mile tour was meeting the people along the way, the people who drove hours from the comfort of their homes in places like Niles, Ohio just to shake our hands like we were heads of state. But there Tim Nash was one late afternoon in the parking lot of the hotel our group was riding to. He was getting ready to go out to find us on his bike just so he could say he rode with us. And he did the next morning when he showed up, hugged Chuck Wakefield (not only a cancer survivor/patient but one of the riders going cross country) and told him that because of his involvement in the ride, he is giving hope to others, Tim included. Tim Nash has multiple myeloma, and like everyone else on the planet, doesn't know what is in store for him in the future. But Wakefield, a retired Army colonel and semiretired dentist in the Dallas area, is an anomaly. He is 71 years old, has had multiple myeloma for more than 14 years and was putting his body on the bike for 45 riding days through 14 states — from Pacific to Atlantic Oceans. He was part of the journey across America because he wanted to challenge himself and in the process challenged others not to give up hope, to continue fighting because maybe one day in the near future, something will develop which will find the cure for this cancer. It is too late for my friend Roy Gross, who died from the disease in early 2012. He was the Putz (I am the Moron) from the Grumpy Old Men movies, and while he lived in Idaho and I lived in Miami at the time, there was always something going on between the two of us to make the other laugh. We sent the same birthday card across the country twice a year, each time a new page stapled to what became a very expensive package to mail. A couple of days prior to his passing, I told him that I was going to ride across the country on my bicycle, raising money for multiple myeloma research. Time restricted me from going coast to coast so I designed a Florida to Maine ride. While I was planning the trip, I found the MMRF and so on Father's Day that year, I, along with my friend Diane Sawyer, started the 17-day trip on our bicycles from Jacksonville to Maine with my wife Bobbie driving our van directly behind us. At the end of the ride, Alicia O'Neill from the MMRF was there and I suggested she put together a cross country ride as a fundraiser. Roy and I had discussed a Portland (Oregon) to Portland (Maine) ride when we both retired. Four years later, Alicia called me and said to get ready: Janssen Oncology was sponsoring the ride in 2017, and we should start training. We were going coast to coast. My bucket list item was going to happen. Because of social media, people around the country and the world were following the group mile by mile, day by day, state by state. In the west, the ride was more about the individual goals for Wakefield, his friend Darrell Rose, Manhattan resident Mike Morales, New Jersey guys Bob Goodheart and Mike Grant and me, a 66-year old who had this ride in mind since my teen years when I thought it would be great to ride to Los Angeles from New Jersey where I lived at the time and then throw out the first pitch at a Dodgers game. Once our tour made it through the extreme heat of the Mojave desert and climbed out of Sedona to more than 7,000 feet elevation, I came upon an area of New Mexico which just stopped me like I had slammed on the brakes of the bike to avoid hitting something. To my left were miles and miles of pasture with no buildings in sight. To the right was the ski area and mountains outside Santa Fe. I was leaning on my handlebars for close to 20 minutes just soaking it up when Wakefield approached. The two of us then stood there for close to another half hour, realizing then, for the first time for both of us, that what we were doing was big. It was a BIG DEAL. How big? People were sending messages our way explaining what we were doing was extraordinary when in fact, all six of us thought just the opposite. We were handed a cue sheet (directions) by the staff of CrossRoads, a terrific company and the best in the industry to take cyclists safely across America, and our job was to ride our bikes from hotel to hotel. Sometimes that was as few as 40 miles, other times it was 100 or more, but roughly about 80 a day. For the six-man group, cycling was part of their lives and while the length and magnitude of this ride had not been attempted by most, the personal challenge was a strong enticement to sign up and start training, which we all did this past summer prior to the September 3rd launch from the Los Angeles area. During the first week, the group was joined by 11 others — Desert Riders they were called — who rode the first portion of the trip, finished and departed from Flagstaff. Kiel Weston also was part of the cross country team, but unfortunately at mile 10 of the first day, he took a fall, broke his left arm and wrist and was out. He did, however, drive back to meet the cross country riders in Missouri and spent a week with us, driving his car, not riding his bike as he wanted to be a part of the journey. But the enormous task of the long cycling days, tired muscles, endless climbs (the final total of feet in ascent for the group was close to 100,000 feet) and gallons of water and Gatorade consumed was overshadowed time and time again by people literally flagging us down in the street, like Stephani Krzysik did one morning from the bike lane directly across the street from her bed and breakfast home in Waterloo, NY. We were in the last hundred or so yards of a long descent when we saw this large individual standing in the street with her arms up, yelling, "Stop! Stop!" Not knowing what was about to transpire, we approached cautiously until Stephani asked, "Are you guys with the MMRF?" She became our best friend immediately. Somehow she knew we were coming through the town and luckily had gone outside just as the CrossRoads support van was passing through at about 20 miles per hour. "I knew you guys would be close behind," she said. Why did she go and stop the tour for the 30 minutes we were there talking? Because she wanted to thank us for what we were doing, bringing awareness to people across the country, to people who might have been told to get their life in order because they only had a short time to live. Kathleen Kauffman's brother showed up in one of our hotel lobbies with a picture book of Kathleen's involvement of a hike down the Bright Angel Trail (Grand Canyon) as part of the MMRF's Moving Mountains for Multiple Myeloma Program. He was there to thank the riders, to let them know that while Kathleen is losing her battle with the disease, it was because of the MMRF and that community that she was able to do the hike and to extend her life, as little as it might have been. Kathy Giusti was told 20 years ago she had only a short time to live because she was just diagnosed with multiple myeloma and there was no cure. Still isn't. But she didn't sit down and go into a fetal position and ask, "Why me?" She started the MMRF in Connecticut and because of what she has done and continues to do, the disease isn't an automatic death sentence. My friends Jean and Carmen (and Chuck) can attest to that. Kathy's efforts have disrupted the cancer research community because the way it was set up when she was diagnosed was too slow and no one collaborated. The work she and the MMRF are doing are breaking new ground and accelerating cures for cancer. TIME magazine named Kathy Giusti one of the 100 Most Influential People in the World, and I know that thousands of patients around the world will agree. In 2015 alone, four new medicines were approved by the FDA to fight multiple myeloma and things are happening much quicker these days to the point where scientists are starting to delve into smaller aspects of the big picture. Just talk to my friends about how amazing Kathy is and the work she and the MMRF continue to do. At the finish line in Connecticut, Jean and Carmen saw her in the crowd during the presentation and rushed to hug her. They are alive today because of what Kathy has done and continues to do. But unfortunately, there are places in the country that don't know anything about multiple myeloma, as desert rider Randi Schwartz can attest. She is a patient as well. She is a superb athlete but has suffered kidney damage because of the cancer. So twice during the first week through the heat and arid conditions of California and Arizona, she had to go to the hospital (with a doctor's note no less) so she could get intravenous fluids. Doctors and nurses out there, Randi said, didn't know anything about her disease, didn't know what to do until they read the doctor's note. Today, however, those same doctors and nurses know there is such a thing as multiple myeloma and because of Randi, now know some of the symptoms and maybe, just maybe, they will be able to save a life in the future. All because Randi decided to punish her body and ride the first week — more than 500 miles — and be a part of this tour. And let me say here also that she was not just physically involved, she was the No. 1 fundraiser receiving more than $100,000 in donations. So often during the tour, people would see the group, all wearing the same Road to Victories cycling jerseys, and ask what we were doing. Usually the first reaction was "You are doing what? and the second would be, "you are crazy." But then we would get people like three senior women we met in a Dairy Queen in Kansas who reached into their pocket books and came up with a $10 donation. Or the couple Wakefield and I met in another Dairy Queen who engaged in conversation about our tour and then told us his mother died from multiple myeloma and offered to donate on our website. It was little things we encountered all of the way across which made it worthwhile. It stopped being about me riding my bike across the country but about what the group was bringing to small towns across the nation. It wasn't about riding on the old route 66 highway and seeing the remnants of towns destroyed by the interstate highway built a couple of hundred yards to the side; or standing on the corner in Winslow, Arizona; or seeing hundreds and hundreds of miles of corn fields all of the way from Kansas to Connecticut. It became personal and emotional. Personal because one day in the last week, when the riding conditions were ideal and I was behind the others by 20 minutes or more, just taking my time, I had a chance to talk to Roy again. I did all of the talking, unfortunately, he did all of the listening. I told him how he would have loved being part of this team, how he would have fit in with the six diverse personalities which blended together quickly and seamlessly and I was just a couple of days away from completing a promise I had made to him. So on Oct. 21, mid-afternoon, when each of us rode single file to the finish line, past 100 or more people lining the chute, past my brother Bruce who drove a couple of hours up from his New Jersey home to be a part of the day, I couldn't contain my emotions anymore. I was yelling, shaking my arm and fist in a happy celebration. I finished my physical challenge, which 50 days earlier appeared so overwhelming that friends were seriously concerned about my well being. I didn’t know what was ahead — not many of us do. Looking back, except for all of the climbs and that afternoon of 140 or more hills in Missouri, the Road to Victories tour was not as difficult as first imagined. Our team worked together daily to pull each person into the safety of that night’s hotel. More importantly, our group made a difference to a couple of individuals along the way. How many? Not sure, but does it really matter? We made a difference to one person — Tim Nash — and for us, that is a big deal. Marty Perlmutter was the lead columnist for The Tee Times golf publication in South Florida for 10 years and presently lives in Winter Garden, Florida with his wife Bobbie. His involvement with the MMRF started in 2011 when he started doing research to find treatments for his friend Roy Gross, who passed away in 2012.